Endodontic cavity preparations deal with both coronal and radicular cohorts that flow together into a single preparation. 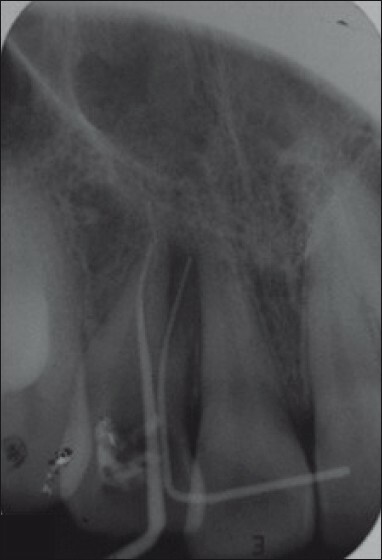 A root with gracefully tapering canal and a single apical foramen is more of an exception rather than a rule. Investigators have shown multiple foramina, deltas, accessory canals etc. in most of the teeth. Successful endodontic treatment depends upon the thorough knowledge of internal anatomy of pulp space and its variations. The practitioner should always be aware of the possible anatomical variations in the root canals of the teeth and try to correctly judge their location, length and relationship to one another. The pulp chamber of maxillary lateral incisor is wider mesio distally than buccolingually. Cross section at the Cemento enamel junction (CEJ) shows a pulp chamber centred in the root; and its shape may be triangular, oval, or round. From the CEJ, the pulp canal usually becomes round in cross section in the midroot and apical areas. The lingual shoulder of dentin must be removed before instruments are used to explore the canals. Many anatomical studies have declared that maxillary incisors are always comprised of a single root, while case reports have been documented suggesting lateral incisor with two  and three root canals. The term "supernumerary root" is used in describing the development of increased number of roots on a tooth compared with the classical description in dental anatomy. The external access outline form for the maxillary lateral incisor may be rounded, triangle or an oval in shape. This case reports a successful endodontic retreatment of maxillary lateral incisor with two roots and two root canals. The accessory root canal was not recognized in the initial endodontic treatment and hence failure of the treatment occurred. After an endodontic treatment, the case was reviewed at every six months interval for a period of two years. A 25 year old male was referred to Department of Endodontics with a history of mild pain and swelling in the upper right lateral incisor of 10 days duration [Figure 1]. Dental history revealed root canal treatment done from a private clinic 7 months ago. Medical and family history was non contributory. Clinical examination showed normal number, size and colour of all teeth. 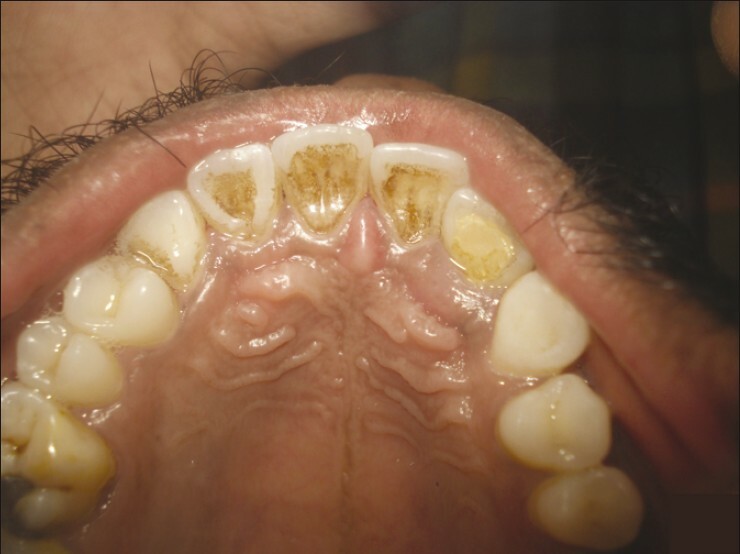 A swelling in the palatal aspect of right lateral incisor was observed, but there was no fistulous tract. A temporary restorative material was seen in the palatal aspect of the lateral incisor. 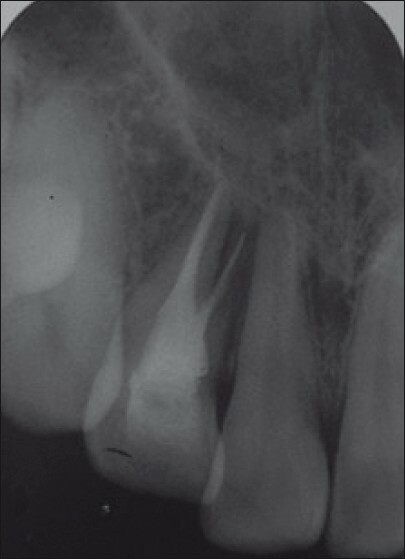 Radiographic examination revealed a poorly condensed overextended root canal filling, and an accessory root and canal which was not obturated. An occlusal radiograph and a second intra oral periapical radiograph with altered (mesial tube shift) horizontal angulations revealed an additional palatal root (same-lingual, opposite-buccal: SLOB rule) [Figure 2] and [Figure 3]. In view of the clinical symptoms, periapical pathology and faulty obturation, a non-surgical endodontic retreatment was planned to locate, debribe and obturate the missing root. 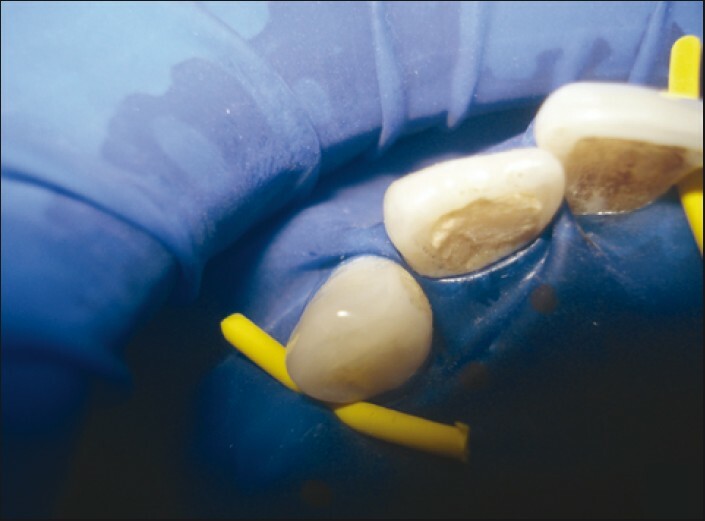 The tooth was isolated with optra dam (Ivoclar Vivadent) [Figure 4], and the temporary restoration was removed with high-speed round diamond burs No. 1015 (KG-Sorensen, Barveri, SP). The overextended gutta percha was removed by chloroform and alternatively by Hedstrom (H) and K-file (Densply-Maillefer, Ballaigues, Switzerland). Careful exploration of root canals with DG 16 probe revealed two canals one mesial and distal. Both the canals were negotiated, patency was checked and working length was determined by electronic apex locator Root ZX (J.Morita MFG. Corporation, kyoto, Japan) and by files in radiograph [Figure 5]. Protaper files (Densply-Maillefer, Ballaigues, Switzerland) with alternate irrigation with 2.5% sodium hypochlorite and saline were used to clean and shape the canal. The temporary restoration was removed, and root canals were irrigated and dried with paper points. 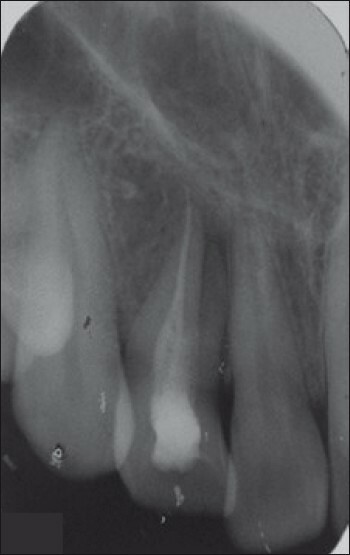 The obturation of the root canals was performed using lateral compaction technique with AH plus as the sealer. The access cavity was then restored with composites [Figure 6] and [Figure 7]. An endodontic microscope may be useful to locate the additional canal orifices. The experience from the present case demonstrates the variability of root canal morphology of maxillary lateral incisor. The clinician should be careful that even the most routine of cases might deviate from the usual. In conclusion, the clinician should be careful about the possible anatomical variations in the root canal configuration. The importance of careful preoperative evaluation with different diagnostic resources available cannot be overemphasized. The entire volume of the root canal space including accessory root canal and foramina should be filled so that a hermetic apical seal is obtained. 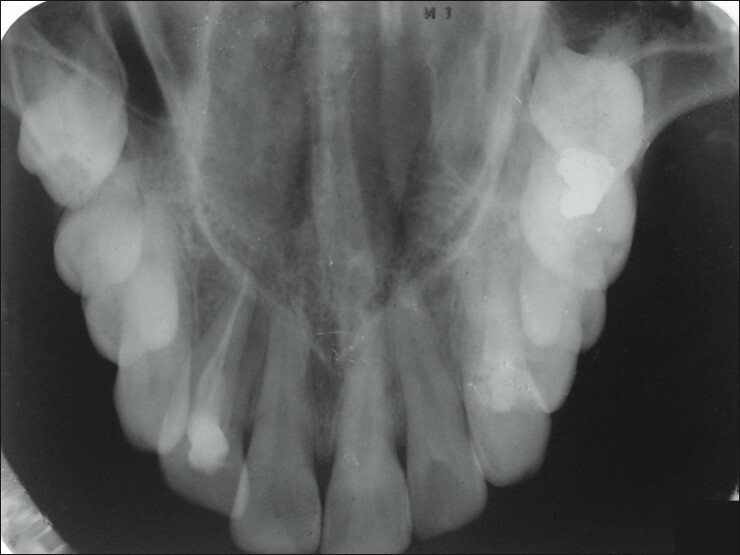 Thus, this case report demonstrated the importance of a correct diagnosis for the endodontic practice. Finally, it is also important that the endodontic treatment be reviewed periodically to ensure continuous healing without complication. 1. Pecora JD, Santana SV. Maxillary lateral incisor with two roots-case report. Braz Dent J 1992;2:151-3. 2. Walvekar SV, Behbehani JM. Three root canals and dens formation in a maxillary lateral incisor: A case report. J Endod 1997;23:185-6. 3. Neville BW, Damm DD, Allen CM, Bouquot JE. Oral and maxillofacial pathology. 2 nd ed. Philadelphia: W.B. Saunders; 2002. p. 88. 4. Kelly JR. Birooted primary canines. Oral Surg Oral Med Oral Pathol 1978;46:872. 5. Vertucci FJ. Root canal anatomy of the human permanent teeth. Oral Surg Oral Med Oral Pathol. 1984 ; 58:589-99. 6. 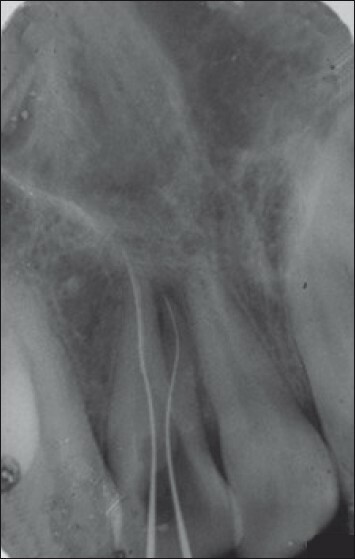 Sachdeva GS, Ballal S, Gopikrishna V, Kandaswamy D. Endodontic management of a mandibular second premolar with four roots and four root canals with the aid of spiral computed tomography: A case report. J Endod 2008; 34:104-7. 7. Krasner P, Rankow HJ. Anatomy of the pulp-chamber floor. J Endod 2004; 30:5-16.
johns, d. and shivashankar, v. and shobha, k. and johns, m.